Protect all of your email from spam. 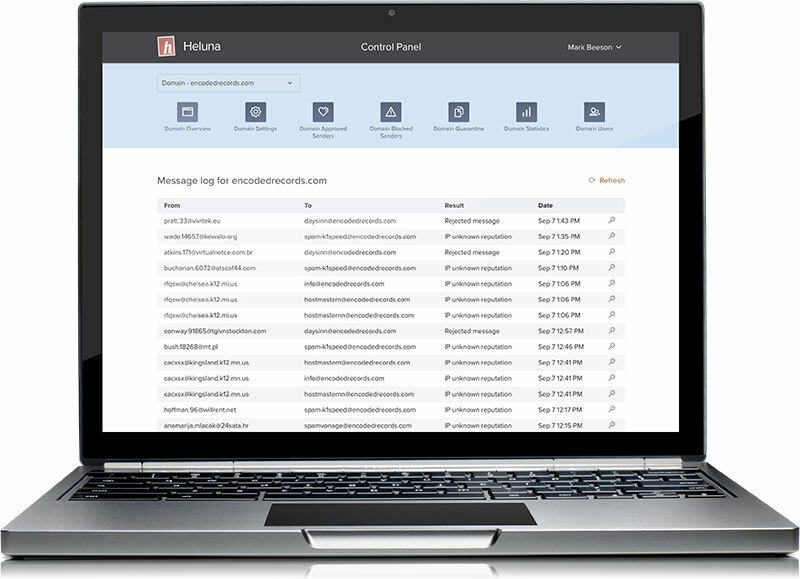 Heluna is a cloud-based antispam service that works with your current email infrastructure. Heluna starts working within minutes. A quick DNS change to your domain, done by you or your hosting provider, and you're up and running. The Heluna service will immediately start filtering messages destined for your mail server. Within a short time, generally about a day, your users will have spotless inboxes. Unlimited domains, unlimited mailboxes, one low price. Every Heluna account can have as many domains and as many users as you like. We don't limit our email protection. Heluna billing is based upon the number of "clean" (non-spam) messages that your account receives. Sign up for the Heluna on-demand service, or subscribe to	one of our pre-paid plans for even greater savings. Advanced filtering and functionality for everyone. No matter what size your organization, you'll get the same filtering capabilities that other providers only make available to enterprise customers. You don't need to spend a ton of time managing preferences – Heluna out of the box is designed to be a zero-maintenance product. Just turn on the Heluna service and you'll see amazing results right now. Ready to start getting some sanity in your inbox? Take our free two week trial, and you'll rediscover what email is like without spam.